BEAUTIFUL CALCITIC LEPTOSPHINCTES - JURASSIC DORSET. Matrix free Ammonite. To the very protoconch on both sides. Shows no less than 6 'constrictions' or growth arrest stages. These are very characteristic of this genus. Lovely sutures. Cream coloured calcitic shell. A very attractive Ammonite. 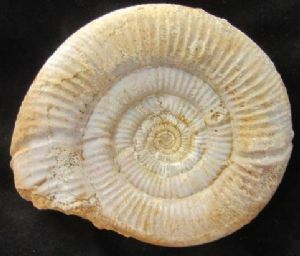 Ammonite approx 8 cm diam.